Processing high volume jobs with ease, the KOBRA 300 CC2 Cross Cut Paper Shredder is a perfect blend of form and functionality. 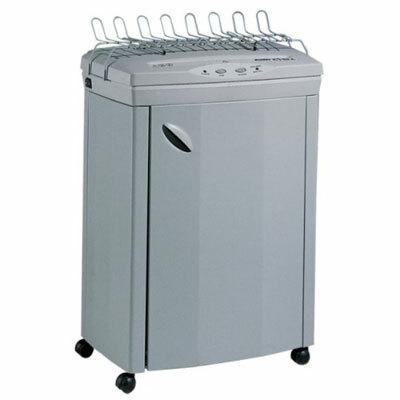 This cross cut office shredder is an ideal mid-size shredder that offers high security. This paper shredder system has the capability to shred up to 17 sheets at a time with a maximum speed of 24 ft./min. The 300 CC2 Kobra paper shredder produces (3/32 x 5/8) inch cross cut particles that cannot be reassembled. You can use this system for destroying papers, staples, paper clips and credit cards. For easily shredding documents of varying sizes, this cross-cut shredder features a 12-inch wide feed opening. While its automatic start/ stop function ensures convenient operability, the automatic reverse function ensures protection against jam and blockages. The 'Energy Smart' mechanism of 300 CC2 Cross Cut Paper Shredder helps in saving power. It comes complete with 36 months defective parts warranty. Shred Size 3/32" x 5/8"
Dimensions (WxDxH) 17" x 12.25" x 32.5"